These days I wish one day were 48 hours. I feel like chasing time all the time. What you want to do and what you have to do don’t always meet, but at least we’re all running, aiming for that dream, I hope. I’ve been a kind of nomad cook for a while, cooking out of a suitcase. I dream about having a big kitchen with good lighting and being able to cook at daylight. However, I am still a cook on the road, changing places, and that is why I equip my kitchen with minimal cookware, but I’ve managed to cook and blog all along the years of moving around. I’ve drawn to foraging food, since I got here, which has been so enjoyable, I mean, it gives the feeling of ‘living’, walking through the forests picking plants, weeds, nuts, fruit, etc. I’ve been discovering many weeds and plants that I’d eaten but hadn’t seen fresh. I saw ladies picking this creeper vine leaves and wondered what they were doing with them and I knew then that these were edible. Last month, I ate salad in a restaurant and the leaves in the salad pricked my tongue and mouth giving me a strange sensation but Mr.O was laughing, watching me and saying, “It’s nice, isn’t it?” So I said, “No, it’s NOT nice; it’s bizarre.” I kept eating, though lol. At that time, I didn’t realise they were nettle leaves. You didn’t know you could eat them fresh, did you? Since then, I’ve been looking around the neighborhood for this weed with no avail. Then, I got a surprise last Sunday when I made our usual visit. My sweetie apparently pestered his dad secretly by asking to collect some for me. 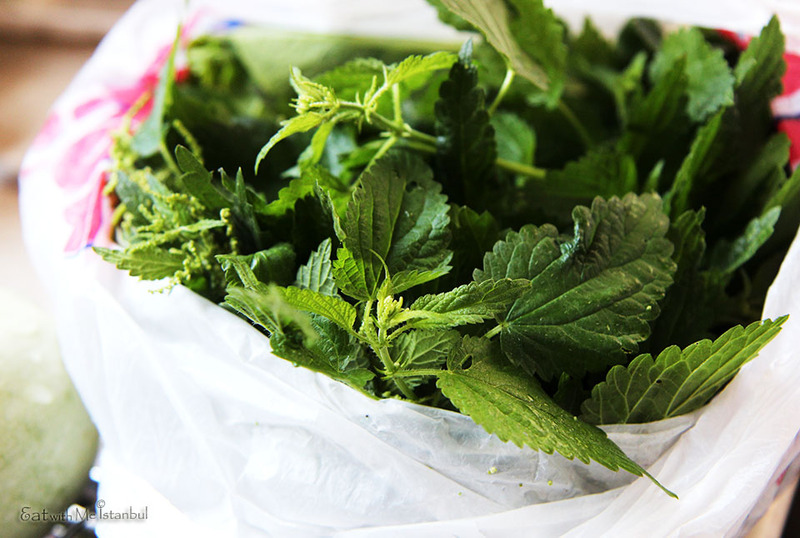 Oh, what a joy it was to see a bag full of nettles, ısırgan otu in Turkish. I’ve eaten it in restaurants but I couldn’t make the connection between the name and the actual thing up until recently. I also didn’t realise it was similar to the spring wild plant that I used to eat and loved growing up. My mum used to make juice with it saying how medicinal it was. Oh, yeah, it’s time to work on them. But what should I make? Since they were precious, I thought I’d give them a special treatment instead of turning it into a soup as many would do. It coincided with a discussion between Mr.O and me about Turkish ravioli, mantı, Italian ravioli and Chinese dumpling. Which one you do like the best? He said, manti!!!! Infuriated, I wanted to prove him wrong so I rolled up my sleeves and started on making ravioli without any tools, neither a pasta maker nor a ravioli rolling pin, and also not even a fluted pastry wheel. So this is a recipe for a nomad cook. First, you make the dough by mixing the ingredients stated in the recipe section at the end of the post and knead until the dough become elastic and rest it for 30 mins to 1 hour. For this, I experimented by adding 2 Tbsp or so semolina flour; I could’ve used more if I’d had more but I though I could grind coarse semolina into fine flour in a food processor but seeing that it wasn’t going anywhere after running it for 10 mins, I gave up. Sometimes I can be really stupid and stubborn. While the dough is resting, you can make the filling or before making the dough. Check the ingredients below again for the filling. After wasting the nettles in vinegar water, I blanched them quickly in near boiling water for less than a minute. I quickly rinsed under cold water and squeeze out as much water as I could. Then, I mixed it with cheese and others. I would usually make ravioli with ricotta cheese but as always, I cook with what I already have in the fridge and I happened to have the Iranian walnut cream cheese to finish off so I decided to use it as it was a present from my Iranian guests and I didn’t want it to go to waste. I also had some pumpkin, which had been cooked and pureed a few days ago so I needed to use it up, too. As it happened, since I was using cream cheese instead of ricotta, pumpkin might have lighten up the filling. Ok, now, roll out the dough as thin as you can while rolling the dough around to preventing it from sticking to the work board. You need to make a mental note on how many you want to make and how big you want them. My plan was to make different shapes so I divided the dough in half and molded out circle shapes by using a cookie cutter. First, I made the circles, which was like making Chinese dumpling sheets actually. Place the filling on one sheet and wet the edge with a little water using the tip of your pinky. I wondered while doing this that women with nail art would definitely need the special ravioli rolling pin or would they just buy them from an Italian deli? Sealing the ravioli tightly while pressing out air pockets. Then, you can press around the edge with a fork to finish off. Now let’s move on to the squares. It can be easier and harder at the same time. The most important thing is to leave enough space between the balls of filling in order to cut between them. Don’t worry about how straight the edges are because the inconsistent look gives a rustic feel anyway lol, and also you will trim off the excessive dough later. Place the filling balls along on one side and cover them with the other sheets, lining one end carefully. If you’re slow and the dough dries out, dab a little water on the edges before sealing them. Run a knife or a pizza cutter to cut into squares and seal the edges the way you did with the circles. Now give yourself a little pat on both shoulders for the proud work you’ve just done. You’ve made ravioli without any tools! Are you proud? Yes, I was! Perhaps because of all the work I did, the ravioli tasted amazing. I couldn’t stop complimenting it as I was watching Mr.O enjoying it immensely like I was. I cooked some for the night and froze the rest to eat later. Actually, I am posting this on the request by someone who had seen these photos the night I made it. The sauce I made for the ravioli was simply butter and herb, precisely strange tangy butter called Susurluk butter, which is made of the butter left off after making ayran, a well-known watery and foamy yogurt drink. It was like half cream and half butter and it’s always sold, kept in cold water.You can have a peek at what the Susurluk butter looks like on the linked Turkish blog. I didn’t know what to do with it, which was quite expensive, compared to normal butter. And when you imagine the process of making it, you wonder why it is so. It’s normally eaten at breakfast but I rather thought, considering the taste and texture, that it would fit nicely with scones or pancakes. I will need to think of other uses for that as I have a whole ball to finish and it goes off quickly. Anyway, I pan-grilled oyster mushrooms with a little garlic and parsley and put them aside, and I added a dollop of the tangy butter into the same pan and scorched a bit with a little white wine. I quickly tossed the cooked ravioli in it and served with grated Parmesan cheese. And voila! Let’s dig in! Mr.O asked for another plate. But I said, no another time, because I wanted to share the rest with his dad, who had collected the nettles for me. And guess what? I made a quick pasta for lunch using the edges trimmed ff the dough, which had been dried in the fridge, and it was so convenient and excellent. Why waste, huh? fresh herbs you fancy, such as sage, basil, etc. NB: if you’re in Turkey, you can try Susurluk tereyağ for the sauce in place of butter for a change of taste. This is too much deliciousness for me to handle. I must make this ASAP since nettles are one of my favorite foods! Lucky you have a helper in the kitchen to wrap all the ravioli! It was hard for me to take photos with floured and messy hands. Look forward to your stories. Thanks for stopping by. 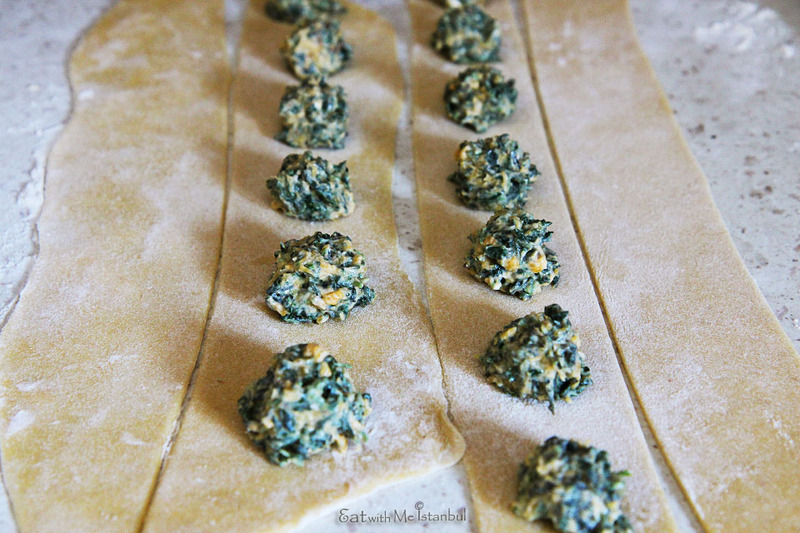 Ravioli with nettles is such a great idea! 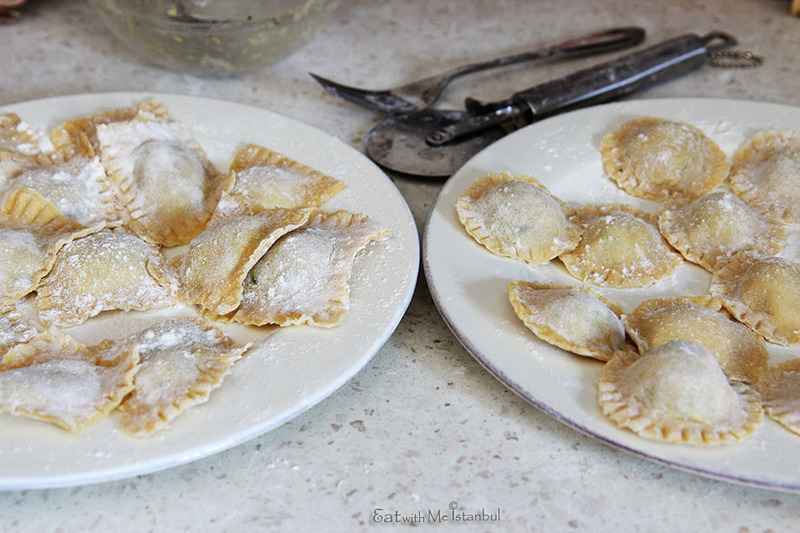 We make its salad, borek and soup but never thought of making mantı or ravioli with it. 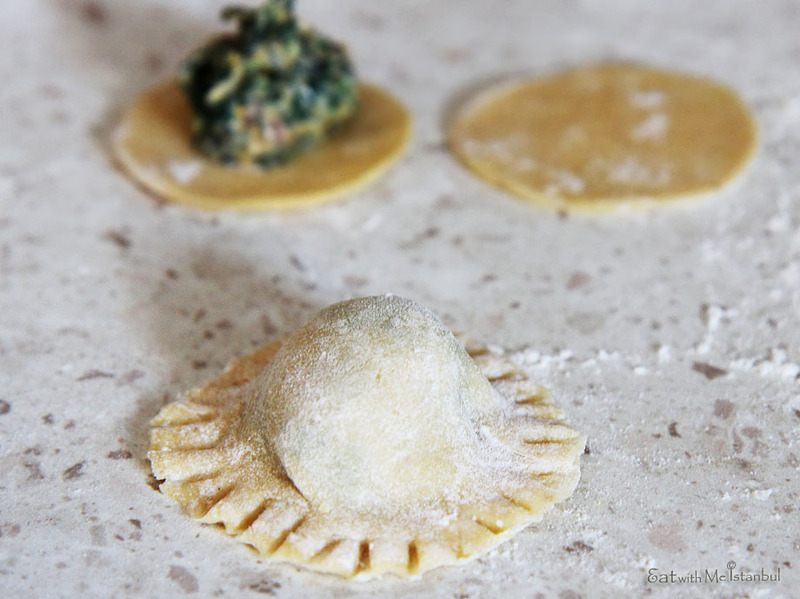 It looks like you have great cooking skills to make this amazing looking ravioli without any device! A must try recipe for me! And thank you for linking to my ayran! Actually, I made manti with the trimmed-off dough, which looked so cute! I’ll try making it again in the manti shape next time. By the way, I love your blog. The photos and recipes all look so amazing. Thanks for stopping by! Your blog is amazing! Very glad to have discovered your blog. I am a pasta addict, ravioli and agnolotti in particular. If only it contained less carbs! I used to get semolina flour from gurmenet, maybe you’re familiar with them, but they dont carry it anymore. It was an italian brand, molina? I guess. Where do you get yours? Thank you for the compliment. Who doesn’t like pasta only if the carbs guilt doesn’t dominate? That’s why I made ravioli with lots of stuffing and thin sheets lol. Well, don’t call me crazy. I actually ground semolina into fine flour, but don’t even think about doing that because it takes a lot of time and energy, above all, the noise you and your neighbours have to endure. You can eat semolina flour at Eataly if you’re in Istanbul. I might one day try to make pasta by soaking fine semolina in water. I don’t see why it shouldn’t work. Anyway, I was happy to have discovered your blog, too! Previous PostRamadan, can’t go without mentioning it?